Pop Goes The News — Canadian actor Nathan Fillion has reprised his role as Capt. Malcolm Reynolds on Firefly — for a T-shirt. Fillion says 100 per cent of the proceeds will support Kusewera, a California-based organization that aims to “empower and educate” children in impoverished countries through play. Browncoats (the nickname for Firefly fans) are snapping up the apparel, which sell for between $23.99 and $39.99 US. Though Fillion set a goal of 500, more than 9,600 shirts, tanks and sweats were sold in the first week of the campaign. Jared Padelecki, one of the stars of the made-in-Vancouver series Supernatural, donned one of Fillion’s shirts and tweeted his support to his 2.1 million followers. Fillion’s fellow Canadian William Shatner retweeted Padalecki’s photo to his 2.3 million followers. Firefly, a sci-fi western, was cancelled after only 11 episodes in 2002 but developed a cult following once released on home video. Fillion reprised his role for the 2005 movie Serenity. 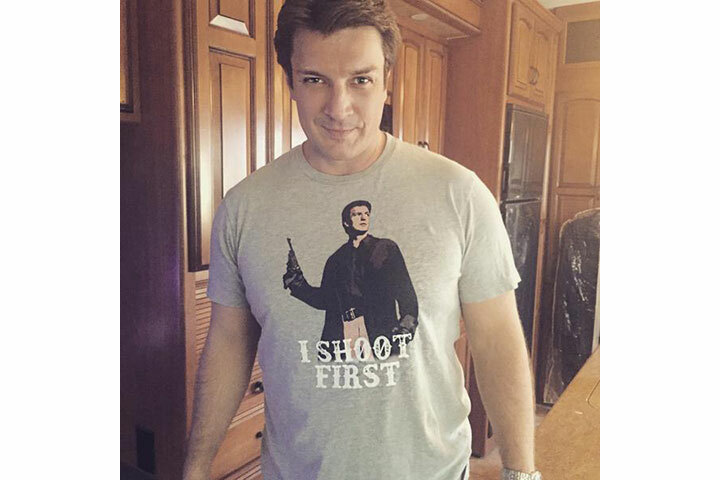 Fillion’s T-shirts are available until Aug. 19. The Castle star is also asking fans to help raise funds for restoration of Edmonton’s Varscona Theatre. Fillion is offering signed memorabilia and other rewards — including voice mail greetings and personalized videos, plus a chance to fly to Los Angeles and have lunch with him. The Prizeo campaign ends Sept. 28.